Facebook Open Graph 2.0 module for Magento allows store administrator to add "Want" and "Own" buttons to Magento products. 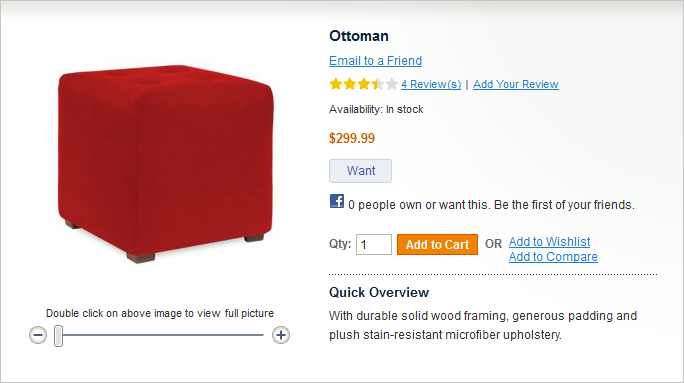 When customer clicks "Want" on a product, this product will be added to Wish list (or Gallery) in his/her Facebook account. Moreover, all Facebook friends will see that visitor want this product. In fact you can configure your Magento to show any button, not only "Want" or "Own". You can add any action and object, for example "Want" action for a "Gift", "Listen" action for a "CD", "Cook" action for a "Recipe". And all Facebook friends will see what he/she Cook, Listen and Want. This is new Facebook tool that will help users to better express themselves. Facebook Open Graph 2.0 module is compatible with Magento Community and Magento Enterprise editions. 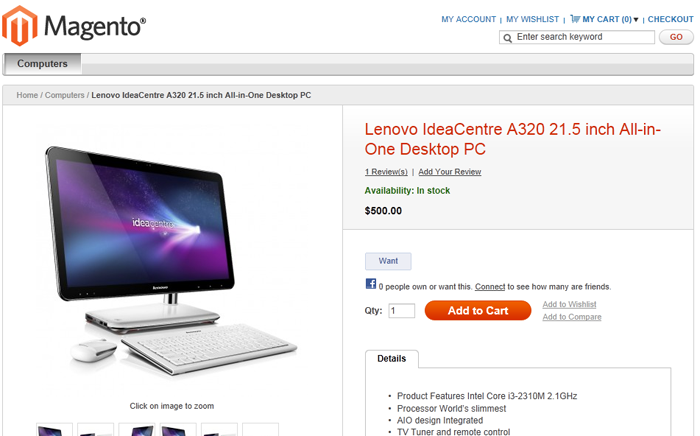 Magento is the first eCommerce system that fully integrated with this new feature. With the Open Graph, your Magento store becomes a part of the user's identity and social graph. As users interact with your Magento store, actions are displayed on the users' Timeline and their friends' News Feeds and Tickers. Open Graph "Want" button is great way for any eCommerce shop (especially Gift shops or Fashion shops) to show users wish lists to all Facebook friends. It is great possibility to socialize your website and drive new visitors from Facebook. 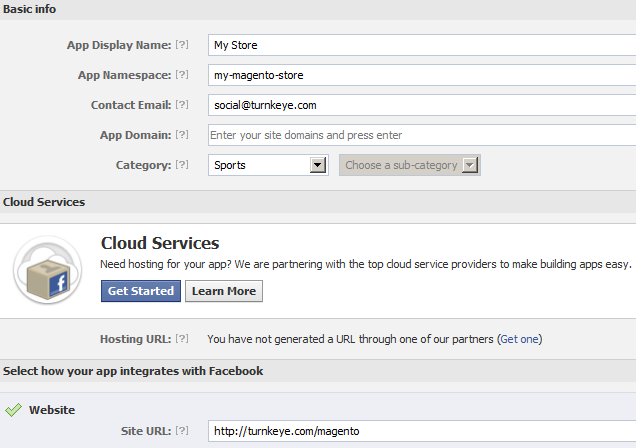 Installation of Facebook Open Graph 2.0 in Magento. 1 - Log in to your Facebook account and visit this page: facebook.com/developers, click "+ Create new App" button. 2 - Enter "App Display Name" and "App Namespace" (Note: you will need to enter the same values to your Magento settings). 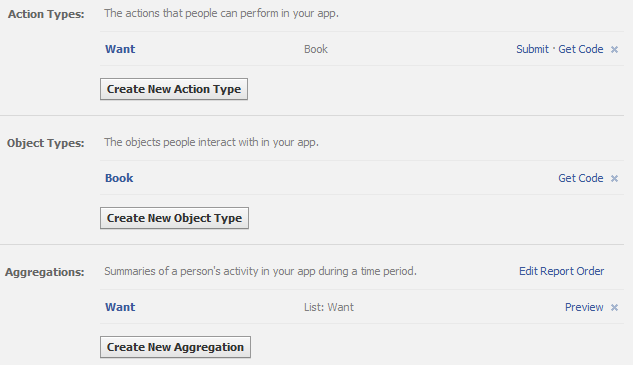 5 - You will see new configuration screen with "Action type", "Object type" and "Aggregation". Click "Create new Aggregation" button. Your Graph will get "Pending" status. Activate your Magento module when configured Graph will be approved by Facebook. Facebook error: The action you're trying to publish is invalid because it does not specify any reference objects. At least one of the following properties must be specified: product. Though i have created application and everything as mentined above.. I have installed this and configured my app - the only problem is that when I click on "love this" or "try this" it shows up twice on my aggregation? It appears to be telling Facebook twice that I love it. Which I do, but I think it would look better only once! How can i submit my app, it says "Publish Actions: You must publish at least one action to your Timeline using this action type", what i want to know is how should i publish my action, because on frontend on clicking the want action it again gives facebook error "Facebook error: The action you're trying to publish is invalid because it does not specify any reference objects. At least one of the following properties must be specified: product." Feel free to contact our support team if you have any issues with modules installations. I installed the extension in Magento C.E 1.5.1.0 version but I can't make it work. Buttons are not showing on the product page and I noticed in Magento connect that the extension is Social_Facebook	1.4.0.0 (stable) even though I installed the 1.5 version. I installed Open Graph 2.0 in Magento 1.5.10 but when I clicked the product details it throw up an error above. Please advise on what to do, There were post related to this error but did not see any reply for fixes. Just wondering if facebook has updated their timeline approach. We are really looking forward to implement this extension. btw, my open graph in facebook apps still pending. so, when facebook launched a timeline ? we must wait until facebook release timeline ? I think, there are some problems if you install Facebook Open Graph extention with inchoo facebook connect previously installed . in config.xml , facebook open graph and inchoo facebook connect are define in frontend xml tag as 'facebook' . it's will cause error in magento facebook connect , because it can't identify an inchoo controller name . Bingo! This is exactly what I´m looking for. Is it also compatible with the latest Magento Enterprise version?